While having deep pockets when you’re kitting out for your adventures would be a dream, it’s not necessary to sell off the house to fulfil all your outback adventure ambitions. Here’s my ‘must-haves’ for setting up a 4WD for touring our great brown land. Every 4WD vehicle should have a comprehensive first aid kit catering for the number of people and the remoteness of your trip, including a dedicated snake bandage, plus the know-how to use it should you or one of your companions get into a pickle. Every 4WD vehicle should have a comprehensive first aid kit for the vehicle. That is; commonly-needed spare parts, plus the tools and at least basic knowledge on how to use them. Even the best-prepared 4WD can break down and having the basics with you may well get you out of strife. Sooner or later you will get stuck and won’t have a passerby to help you out. The contents of your recovery gear may well vary, but the minimum requirements are a long handle shovel and correctly-rated straps and shackles. Some means of helping to move your vehicle forward or rearward is also paramount. That opens up a plethora of gear but generally includes MaxTrax (brilliant on most terrain), a winch (electric is easier than a manual version, although the manual hand winch can pull rearwards) and again, the know-how to use it all safely. The bull bar is always one of the first items I like to have fitted to my 4WD. While it’s not a ticket to slam into everything, it does provide a great deal of safety from animal strikes, minor brushes with terra firma and it’s a beaut place to lean on while you’re poring over the maps you’ve got spread over the bonnet. The bull bar also provides plenty of spots for mounting extra gear if needed. While many will advocate not driving at night, that’s just not feasible all the time. There is nothing worse than peering out your windscreen trying to discern what lies ahead. That’s just dangerous and a decent set of driving lights will help keep you safe while on and off road. Plus, you’ve already got the perfect bull bar to mount them on. Don’t ever discount utilising your mobile phone in an outback emergency, but always keep in mind their shortcomings when away from major cities and town centres. Technology is on our side these days with the availability of UHF radios, Satphones, EPIRBS and the never-ending number of GPS positioning devices available. For both you and your 4WD. I always carry three types of footwear for myself: Double Pluggers are my preferred protection for casual wear (rubber soles and roll bars built in) but I always wear either steel-capped boots or hiking boots when straying away from the vehicle. While fitting boots to your 4WD may depend on the terrain you’re aiming at, I’ve been using the Cooper S/T and S/TMAXX for over 80,000km and give them the big thumbs-up for the one tyre that can tackle any terrain with ease. They’ve taken my 4WD to every part of Australia as well as the dreaded school run every other day. Who wants to eat baked beans, bread and water? Not me that’s for sure. While I’m no fancy cook, I do like to eat well and healthy while on the road. Meat is easily stored if cryovaced (no mess and longer storage periods without being frozen) and there’s no reason you can’t eat similar fresh food to what is dished up at home with all the 12 volt fridges on the market. While we’re talking about fridges: battery power is crucial in this day and age of all things techo. If you’ve got a 12 volt fridge, you need a dual battery system and a decent-sized secondary battery to last the distance. Of course if you’re driving daily, you’ve got no problems with replenishing the battery, but if you choose to camp in the one spot for more than a couple of days, then you need to think about alternate power sources. Generators and solar panels are the two main ways of keeping the battery topped up. I’ve relied on two panels for years and never been caught out with warm drinks or rotten food in the fridge. The smaller 80W foldable Projecta panel is a great one for laying on the bonnet, plus my larger 120W panel if we’re trying our hardest to catch as many of the sun’s rays as possible. If you’re going the generator route, please do consider fellow campers by not running them nearby at night time as noise travels so much more in the still air of a perfect camp site. Don’t forget the fuel to keep them going. You can’t go away without taking your favourite toys, be it the kids’ pushies, the good wife’s knitting needles or your fishing rods. Leave them at home and you’ll regret it. Many conform to the ‘if it ain’t broke, don’t fix it’ theory. 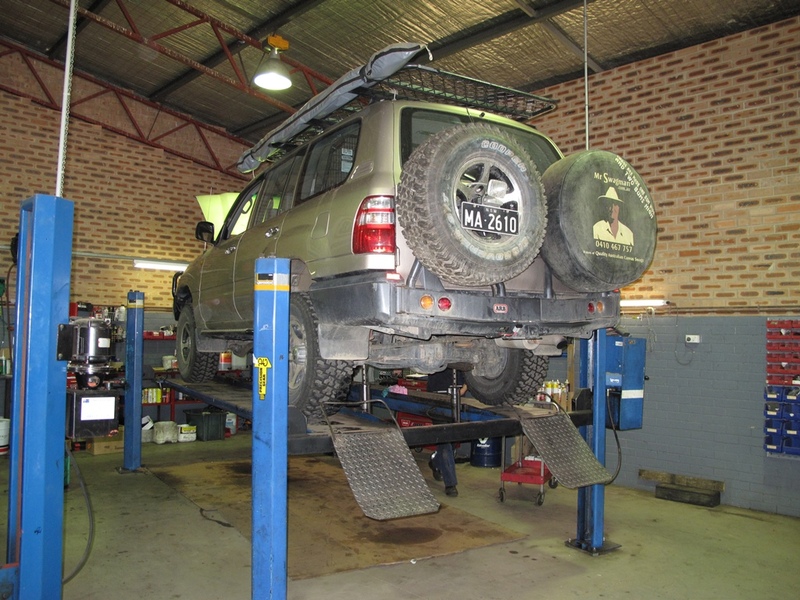 I’d rather know what’s going on with my 4WD’s vital organs so I might pre-empt any problems that may occur…which is always at the worst possible moment in the worst possible place – Murphy’s Law. I’ve got aftermarket gauges to monitor both batteries’ voltage and capacity, engine and gearbox temperatures as well as turbo boost and exhaust gas temperatures. Leave these three things at home and you may as well stay at home or take a visit to your local shopping centre. Sooner or later you will get bogged, geographically misplaced, hurt (hopefully not too badly) or have the need for repairs. Grin and bear it! Don’t bugger the bush for the next person; leave it as you found it and we’ll all be able to visit the same beautiful places Australia has to offer. Idiots ripping up the bush, drunks annoying fellow campers, driving on dirt tracks that are closed, creating bonfires to cook a sausage all give 4WDers a bad name. This’ll no doubt start plenty of campfire discussions as to which accessories you should have. Apart from the aforementioned bull bar and driving lights, the other component I always change early on is suspension. Basically, factory original suspension (springs and shocks) are no match for quality aftermarket replacements, especially when you’ve got a load on board. A snorkel should be high on the pecking list, as should differential breathers (especially if you’re tackling river crossings, but breathing cool clean air via the snorkel helps with everyday driving too). An air compressor and gauge always get a place in my 4WD regardless of terrain. Then there’s maps, maps and more maps. You can never have too many maps and having them digitally makes navigation so much easier. While you might get lost, at least you’ll always know where you are! The last thing I can say about heading bush is, don’t overload your vehicle. There are so many useless accessories that simply aren’t needed and do nothing other than help to overload your 4WD and lighten your wallet. Forget the notion that you need to take spare springs, axles and the like. Taking them ensures you’ll need them due to their weight. Do your research and if you’re planning a huge trip, tackle a few smaller ones first. Anything that seems unnecessary probably is. Don’t believe all those silly 4WD advertisements that show 4WDs splashing through salt water and jumping dunes. 4WD’s break when mistreated. The lucky 16th of my top 15 list… because everyone loves a freebie: take your time and enjoy the moment while you're out touring. We do live in the lucky country.